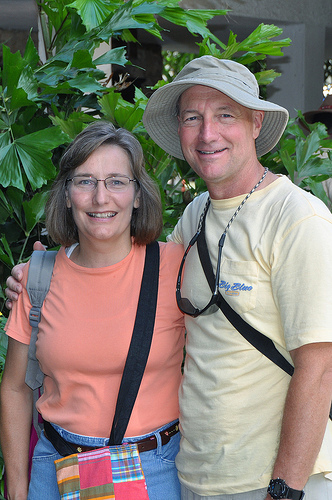 AMCP Advisory Member Greg Draper and his wife Paula celebrated their 30th wedding anniversary by going on a mission trip with 20 other members of Hallmark Baptist Church in Fort Worth, Texas. The group traveled to Mombasa, Kenya to provide footwear for children and other necessities. They also volunteered at feeding centers and schools, as well as assisted medical staff at wellness checkup clinics. for the best photos from the Drapers’ trip. Back in January when Paula and I committed to go to Mombasa on this mission trip, June seemed far away and there was a long list of items to do before we could go. The time has flown and we’ve knocked one or two items off our to-do list every week. Now here we are with just over a week to go before we leave. We’ve applied for passports, gotten enough shots to qualify as pin cushions, bought medicines, packed and repacked and re-repacked to get our bags within the airlines’ specifications. Where did the time go? We’ve had two training sessions at church where we were briefed on what to expect with the long flights, jet lag, new places, culture and people. We learned a little Swahili (“jambo” = “hello,” “asante” = “thank you,” “jina langu ni Greg” = “my name is Greg”) and practiced various crafts to entertain the children. Paula is on the craft team and I’m on the face painting and balloon animals team (I can already make a mean sausage, worm and line segment!). The best part was when Roseline Paige, a member of our church who is from Kenya, prepared a delicious traditional Kenyan meal for us. We leave on the first leg of our flight on the evening of Thursday, June 10, flying nine hours to Paris for our connecting flight to Kenya. During our 10-hour layover, several of us are planning to take the train from Charles DeGaulle Airport into Paris to see the sights, including an attempt to reach the top of the Eiffel Tower. Friday evening we have another eight-hour flight to Nairobi, arriving at 6 a.m. Saturday local time. We’re going to tour the Kibera slum, the second-largest slum in the world, as well as two feeding centers that Manna Worldwide operates in the Nairobi area. Saturday night we board another plane for an hour-long flight to Mombasa. So getting to our mission destination will take from Thursday evening in Texas to Saturday night in Mombasa. We are taking more than 200 pairs of shoes, funded by Paula and I as well as by a number of you folks. Special mention in this regard should go to Ed Dalheim and the great folks at the Association of Marketing and Communication Professionals (AMCP) in Arlington, Texas. Your help in purchasing shoes for African souls is a message of love. The 26 members of our mission team to Mombasa left Thursday at 2 p.m. aboard a bus to DFW Airport’s International Terminal. Each of us toted a carry-on bag and one personal checked bag, paying an extra $50 for a second checked bag that contained our shoes and school and supplies. This meant our group had 52 bags to account for across three flights, two airlines and one ocean. Miraculously, only one piece of personal luggage was lost by the entire team. Twelve of us connected to Kenya through Paris, France and the other 14 connected through London, England. Paula and I were in the Paris group. We left on a completely-filled American Airlines 767 jet to Paris at 7:30 p.m., sitting next to a group of high school seniors bound for France for a summer foreign studies program. I wondered how I would do on such a long plane journey — my previous personal best was two hours to Disneyworld — and found it impossible to get comfortable in an airline seat. The seats are just a bit too narrow to keep one’s rear from going to sleep, and the space between rows is too narrow to stretch one’s legs out comfortably. I think this is designed intentionally because I watched the people in business class stretch out in their fully-reclining seats complete with a full blanket. I only slept for an hour the entire flight. Because Paula is narrower than me and her legs aren’t as long as mine, she was able to sleep a little easier. I occupied my time by reading and trying to keep my “derrier” awake. Still, we were pleased – this is the day we’ve been working toward since January. We had a very moving send-off service at church last night — Hallmark Baptist Church (Fort Worth, Texas) is such a giving, mission-oriented fellowship. Our ministry bags are fully packed, and contain more than 200 pairs of shoes that a number of our supporters have purchased for the children in Mombasa, plus school supplies, recreation equipment, craft supplies, etc. Our group arrived in Paris at 11 a.m. local time. Since we had to wait until 8 p.m. that night for our flight to Nairobi aboard Kenyan Airlines, we had 10 hours to spend in one of the most beautiful, romantic cities in the world. I have to admit that I was looking forward to this layover as much as I was looking forward to reaching Kenya. There were only two things I wanted to do in Paris: have our picture taken in front of the Eiffel Tower, and eat lunch at a sidewalk café on the Champs Elyssee. Each person in our group of 12 (who were connecting through Paris) had purchased a group tour for the day, one of those “hop on, hop off” experiences aboard multiple buses that distribute passengers to the main tourist attractions. After deplaning, we sought the Kenyan Airlines terminal to obtain our boarding passes for the next flight. No problem….or so we figured. But because of inaccurate directions from the airport’s information personnel, we burned over an hour before we secured the boarding passes. Still no problem, we figured. We just needed to buy train tickets. To our horror, however, we found there were only six machines dispensing train tickets for, oh, about a few thousand tourists pouring off planes at the hundreds of gates. The line for each snaked its way around the terminal. After waiting in line for one of the machines, we finally were able to attempt the purchase of our train tickets only to find that our machine took only coins when all we had were bills (we would have known this only if we had understood French). By 2 p.m., with Paris slipping through our fingers, our group decided that our time would be cut too short to attempt the train ticket line again, then go into the city and possibly face the same thing on the other end of the train line for a return ticket to the airport. It was more important to catch our flight to Kenya than to visit the Eiffel Tower and/or eat lunch along the Champs Elyssee. As a result, all we saw of Paris was the inside of the airport. Bitterly disappointed, we ate lunch at a terminal airport restaurant and slept through the rest of our layover on the benches. Later, Paula and I improvised and finally got our photo taken in front of (a likeness of) the Eiffel Tower. By the time our 8:15 p.m. flight to Nairobi left the runway, I had only about two hours of sleep since our 7 a.m. departure from Dallas/Fort Worth International Airport on Thursday morning. Although the effects of jet lag were beginning, I only slept one hour during the eight-hour overnight flight to Nairobi. We arrived at 6:45 a.m. and met up with the other half of our ministry team who had connected through London, England. We collected all our bags and carted them cross the street to the regional airline terminal to check them for their final leg of our journey into Mombasa. After freshening up at a rented house that missionary Sandy Baird had provided for us, we rode a bus to the Kibera slum in Nairobi to see the school and feeding center operating there by Manna Worldwide. This is the second-largest slum in the world, with 1.5 million people living in a 1.5-square mile area. There is no sanitation in the slum, and sewage literally runs through the middle of the streets. You can’t imagine how appalling the smell is. Our team had to carefully navigate river of sewage at the bottom of the hill to reach the school. And yet, there is a foothold of hope in the midst of this abject poverty. We found the children at the school to be bright, polite and joyful. The New Hope Kibera Bible Baptist Church is caring for these kids by providing them with meals and education. In the words of Pastor Ole who serves there, “education equals hope.” Then, we hiked downhill from Kibera to an adjacent hill where property had been purchased for a new, larger school. We then headed across town to see the Bible Baptist Church in a suburb of Nairobi. Like the other churches Manna has been working with, this one began as a church, then became a school and feeding center. The buses took us back across town to eat dinner at an Ethiopian restaurant in Nairobi, and we returned to the airport for our final flight, a 45-minute hop out to the coast city of Mombasa at 11 p.m. Our lack of sleep caused many of us to doze off every time we were still for a few minutes, like in the bus or on the last flight. After landing, we gathered our bags on carts and loaded them onto buses for the final ride out to our hotel, the Severin Sea Lodge on the coast, which we checked into at 1 a.m. on Sunday morning. We had traveled some 56 hours and 9,000 miles over three continents, and were “looking forward” to a 10 a.m. start to our first day of mission work later on Sunday. Despite fighting off the effects of jet lag on Sunday morning, Paula and I were ready to go. Our first assignment was to participate in a worship service at Injili Baptist Church (“injili” is Swahili for “gospel”). Manna Worldwide established a feeding center on the of a struggling Christian children’s academy that serves students in grades 1-8. As a result, the children now eat two meals daily, which is wonderful since most families in this village are impoverished and can’t afford to provide regular meals to the youngsters. Manna also dug a well and provided a spigot for the village people to enjoy clean drinking water. We heard many stories of people filling their jugs at the well on Sunday morning and, upon hearing the church music, approached to see what was happening. We spent the day at Injili worshiping, eating, playing and visiting with the people there. Pastor Alan there were several hundred more people than usual who wanted to see the Americans. The little church was packed with people crowding the doorway and looking through all the windows. After the worship service, we walked through the village to a five-acre site that Manna is in the process of constructing a high school. Kent McMillan, the African director and a leader of this trip, was privileged to dedicate the new high school in the memory of his late wife, Valerye. Following the Manna Worldwide model of needs-based evangelism, there will be a larger Injili Baptist Church on the site, a larger feeding center, another well for the village, and a two-story high school with library and state-of-the-art computer lab. This will cost only $275,000, since the U.S. dollar goes a loooooong way in Kenya. The people here in Kenya are even more beautiful than their country. They are a bit shy at first and not very forthcoming. But it takes just a few sentences of conversation before they warm up instantly and are very open and accepting, full of smiles and eager to share. But all the Swahili I learned was almost for naught as everyone here speaks some English, including even the smallest children. Monday is a school day — just like in the United States — and we returned to Injili for a day with the school children. We led them in crafts, face painting, balloon animals and hats, sports, and other fun. This is a day we have anticipated for a long time, because we finally handed out the shoes you graciously donated to the children here at Injili. The shoes they were wearing when we arrived are part of their school uniforms, and are kept at the school. So, the shoes you purchased will keep their feet protected while they away from school. I wish all of you could have been here to experience how excited the kids were to get (their own) shoes. Today we visited the village of Vipingo and convened our activities with the kids at Crossroads Academy. This is the nicest school in this part of Kenya, and includes a church, feeding center and water well. A Bible college has also been established to train Christian pastors, and currently has an enrollment of 32. We went through the kids’ classes doing our face painting, balloon hats, craft hearts, and other fun-filled activities. This is where we found a young lady named Mercy, and were happy to find that she was normal and doing well in school. We first met Mercy during our church’s last trip here in March 2009, and found that she was suffering from a severe case of hydrocephalis (water on the brain). Her extremities were shaking, her motor functions were impaired and she was having much trouble with her school work. Nothing could be done because her family could not afford the surgery to put a shunt in her head to relieve the pressure on her brain. A young woman from our church on that mission trip fell in love with Mercy and, upon returning to church in the states, made a tearful plea to the congregation to raise money so that Mercy could have her critically-needed surgery. We took up a collection that Sunday and not only raised enough for Mercy’s shunt, but also for her rehabilitation too. Today we’re happy to find Mercy normal and doing well in school. After we said our goodbyes to Mercy, it was off to Mbewau Academy in the village of Mtepeni. This is where Real 4 Christ Ministries has built a new school and church, and construction is 50% complete on a feeding center for the children. The 104 kids here are fed by Manna, but the cooking is done outside in crude conditions. Another new building to handle the feeding and cooking is also 50% complete done thanks to a gift from our church. While we played and enjoyed activities with the children, we also administered tetanus shots to the students to protect them from disease. They didn’t understand the need for the shots, as you would expect, and I was pressed into service as the “anti-Santa.” The kids would sit in my lap, and I would hold them down and restrain their arms and legs so they could be immunized. Not many of them wanted to have much to do with me after that. Approaching the midpoint of our mission trip, today we drove south along the coast highway near the Tanzania border to a village named Perani. En route to Perani, we crossed the bay in Mombasa on the ferry, which transports thousands of laborers to and from work each day. The cars and trucks load first, then they cram aboard as many pedestrians as they can fit. Later, our bus crossed a new bridge that had been built. Rashid, our guide, told me that the bridge was built because so many people were being killed by crocodiles as they tried to cross the river. At Perani, Manna Worldwide has a church, school and feeding center. The pastor had used us as a spectacle to draw the entire village to the school grounds. Many of these people had never seen a white person before. We were quite a curiosity, but after we approached them with a heartfelt “jambo”, the villagers quickly warmed up to us. The pastor hoped that a day of planned soccer and volleyball games involving our group would attract some villagers to church on Sunday. The 16 members of Oak Hills Baptist Church in Kentucky, who had come on this mission trip with us, delivered their shoes to the children of the school. As they handed out the shoes to the children, I saw the faces of the mothers who can’t afford to send their children to this school. And that saddens me. It only costs $5 a month to send a child to Mbewau, but this is beyond the reach of the majority of families in the villages we’ve visited. All of these villages are overwhelmingly Muslim, yet that faith does nothing for the people there. It is the Christians who come in and dig water wells, feed children and provide clothes and shoes. In many of the places where there is a Manna feeding center, the Muslims have built a mosque next door to intimidate the people who want to come there. Yet mothers here are clamoring to try to get their children into one of the schools we’ve visited. Every school has a waiting list of 40-50, even though most families have no means with which to pay the tuition. Our mission trip planners have visited these locales previously, and scheduled a much-needed break in our intense ministry activities. Today we travel several hours by bus northeast into the interior of Kenya to the Tsavo East Wildlife Refuge for an overnight mini-safari. The average Mombasan is hard-working people, but poor. Most people here live on $2 a day. Our guide told me that it is not uncommon for a laborer to walk ten kilometers (6.2 miles) to and from work every day. Every morning and evening literally a million people hit the streets for their foot or bike commute. Since this used to be a British colony, motorists drive on the left-hand side of the road. But there seems to be no traffic laws here. People pass on the two-lane roads even where there isn’t enough room to do so. There are numerous “roundabouts” in Mombasa, which are similar to the traffic circle in Benbrook on Fort Worth’s west side. But where we wait patiently for a break in the oncoming traffic, here they stick the noses of their vehicles out into the flow so that those with the legitimate right-of-way have to stop to avoid a collision. To put it mildly, rush hour here is a nightmare. There are small markets everywhere, tiny clusters of mom-and-pop stores selling everything from fruit to furniture to cell phones, each with a large family living in the back room. The trash blows in the street gutters and gathers in the store fronts. Old paper, plastic, and cardboard discards that no one who lives here seems to see is all over the place. Chris Moore of Real 4 Christ Ministries told us that there is an entire town built on the city dump where people are eking out a living collecting and reselling recyclable goods. Tourist resorts seem to offer the best jobs here, with jobs like bellhops, waitresses, housekeepers and gift shop cashiers. They value their jobs dearly, as evidenced by their good service to the tourists – specifically, us. Today we took an overnight mini-safari to the Tsavo East Wildlife Preserve in south central Kenya. This area is famous for its thriving elephant population, which suffered in years past due to poaching. The Serengheti plain runs through the preserve. We felt right at home here because the grasslands and the scrub trees resemble those in West Texas. Our bus dropped us at the gate and we boarded several old beat-up Land Rovers to take us 65 kilometers into Satao camp, where could get checked in. We didn’t know what to expect, but to our surprise our “room” was a large tent, furnished like a hotel room with an adjoining bathroom and shower. All this is protected beneath a thatch hut with a flagstone front porch that overlooks a watering hole where the animals arrive in the evening. We went out for our first drive to see the animals, traveling more than 100 kilometers over bumpy red dirt roads. We saw giraffes, zebras, spring bucks, oryxs, baboons, giant gazelles, an eagle, hippos, water buffaloes, lions and lots of elephants. That night we traveled back to camp for dinner, and many of us sat around the campfire talking while we watched the animals bed down for the night around the watering hole. When our bedtime approached, we had to be escorted back to our tents because a lion was heard nearby. This was a very exciting day. We were up early the next morning for a 1-1/2 hour drive to see more animals, then back for a quick breakfast before taking the Land Rovers back to the front gate, where our bus was waiting to drive us back to Mombasa. We returned to the Mbewau School, which was opened to all the surrounding village people for check-ups, health screenings, prescriptions and immunizations. We also walked through the neighborhoods and visited with its people. We also invited them to return for the Sunday morning worship service at the chapel at Mbewau. More than 30 people attended Sunday’s worship service, and afterward, we played, sang and did crafts with the children in Sunday school. Then we said a tearful goodbye to these people at this little school where God is doing such big things. We began packing for our flight home on Monday evening. We plan to visit a local market Monday morning to buy “thank you” gifts for our supporters. Again, I wish to thank our supporters for the important role they have played in impacting the lives of children here in Kenya. We estimate that we have reached over 1,000 children while on this trip. It would not have been possible without those supporters.